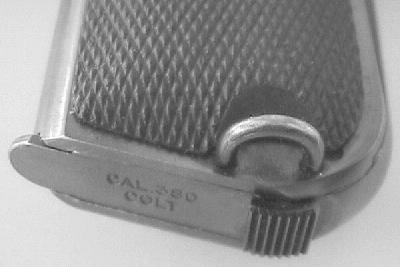 Model M .380 serial number 94016 with rare Factory Lanyard Loop - This gun was owned by Archie Cecil Barnes, the overseas representative for Tidewater Oil Company, (now Arco) whose territory included all of the Middle East. The gun was purchased by him in Shanghai, China in the early 1930's. 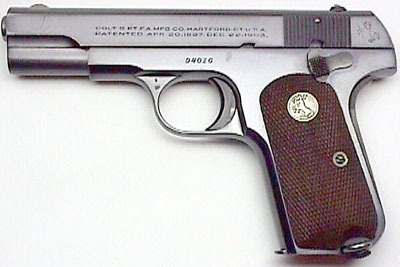 Most of the .380s encountered with lanyard loops were produced for the Shanghai Municipal Police (SMP) contract and are in extremely poor condition. 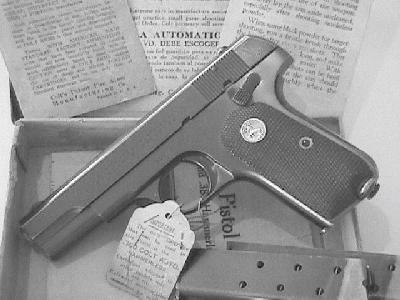 This gun is a standard commercial variation in 98% original condition and is complete with the original box numbered to gun, instruction sheet, proper ammunition pamphlet, shooting suggestions, hang tag and two extra two-tone magazines. 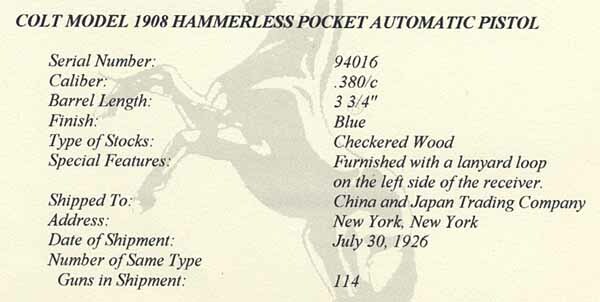 Colt factory letter indicates that this pistol was one of 114 shipped July 30, 1926 to the China and Japan Trading Company, New York, New York (see history of this firm below). The letter also indicates the following special feature: Furnished with a lanyard loop on the left side of the receiver. History of the China and Japan Trading Company - On December 27, 1817, just before Maine became a separate state from Massachusetts, William Hayes Fogg was born on a Berwick farm. The youngest of ten children, William Fogg left school at 14 to clerk in a country store. He failed at his first business venture, but at age 30 joined his brother to create the Fogg Brothers of Boston, a shipping company in the China trade. In 1842, at the close of the Opium War, the Treaty of Nanking had opened trade in five Chinese ports, principally Shanghai, and Hong Kong became a British colony. Then came the California gold rush. Then Tokugawa Japan's closed society opened with Matthew Perry's voyage in 1853. Trade in the oriental market suddenly flourished; clipper ships raced the globe with cargoes of tea and silk. And the Fogg brothers were there. Within five years of starting their business, the Foggs transferred their base to Manhattan and, after his brother's death, William began to lead, at age 38, the firm that would eventually be known as the China and Japan Trading Company. Over the next 30 years his wealth grew as did his position in New York society. At his death in 1884 his personal fortune was valued at over $1.5 million. Besides New York City, the trading company had branches in Shanghai, Yokohama, Osaka, London, and San Francisco.